Celebrate St. Patrick's Day weekend at IRISH 4 A DAY, San Diego's #1 & Biggest St. Patrick's Day Club Celebration in the Gaslamp Quarter! Your ticket includes: • A shenanigan-filled Opening Party at SD's largest Irish Pub, McFadden's • Free entry to 20+ venues • Hosted Welcome Shots • Green Beer/Jameson/Irish Car Bombs Drink Specials • Live Music, DJ, Dancing, Lucky Leprechauns • Parking + Hotel Deals valued at over $400! This event sells out every year, so don't test your luck 'o the Irish! Online sales end at 5pm. Tickets can be purchased in person from McFadden's. (Cut-off time applies at some locations). ALL TICKET SALES ARE FINAL. ABSOLUTELY NO REFUNDS. 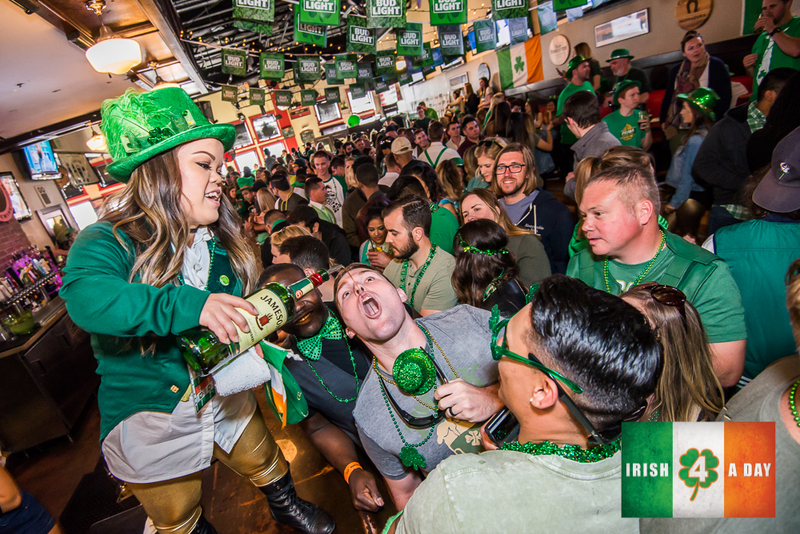 Your ticket includes: • A shenanigan-filled Opening Party at SD's largest Irish Pub, McFadden's • Free entry to 20+ venues • 8+ Hosted Welcome Shots • Green Beer/Jameson/Irish Car Bombs Drink Specials • Live Music, DJ, Dancing, Lucky Leprechauns • Parking + Hotel Deals valued at over $400! This event sells out every year, so don't test your luck 'o the Irish! IRISH 4 A DAY - San Diego's #1 St. Patrick's Day Party Hop! McFadden's San Diego ~ San Diego's Biggest Irish Bar & Club (indoor and outdoor)! All presenting venues are located in the Gaslamp Quarter and walking distance from each other. ► Official Opening Party at McFadden's (will-call) with live music, green beer, Irish whiskey specials, DJ, dancing and more! ► Plus more party perks! ► A fun, unique and progressive St. Paddy's experience planned to perfection with you in mind! ► Dress green or get pinched! ► All the presenting parties are along Fifth Avenue and within walking distance from each other. Put on your comfy dancing shoes! ► A visitor friendly and affordable way to experience the nightlife and dining the Gaslamp Quarter is famous for! ► Purchase your ticket in person or online. ► In-person purchase – you will receive all the passes and drink tickets in advance, and can begin anytime. ► Online purchases – you will receive an e-ticket with a unique barcode for admission. ► Bring your print-out or smart phone to the exclusive Opening Party / Will Call at McFadden's between 5PM - 8PM on Friday and 2PM – 7PM on Saturday. ► We will scan it and issue your Irish 4 A Day Party Passport, passes, drink tickets and a map with pre-planned routes. You may follow the suggested routes or crawl at your own pace. ► Let the parties begin! ► Every year, thousands of party revelers from around the world parade through the Gaslamp Quarter on St. Patrick’s Day weekend, creating the largest St. Paddy’s parties in Southern California. Home to over 200 exciting nightclubs, bars and hotels, the famous Gaslamp Quarter in downtown San Diego is well-known for its festive holidays, pulsating nightlife, diverse dining and exceptional SoCal hospitality. ► With 20+ participating hot spots run by the jolliest leprechauns and Irish fairies, we wish that you ladies and lads will join us for a fun celebration like none other! Get ready to be adorned with LUCKY green beads and an exclusive Club VIP Passport packed with fun perks and priority entry to the sexiest St. Paddy’s Parties in the Gaslamp Quarter! ► IRISH 4 A DAY is organized by GEM – Gaslamp Event Management, Club VIP and Downtown Dolls, San Diego’s award winning and full service event planning, hospitality consulting leader and promotion powerhouse. ► Located in the heart of San Diego’s historic Gaslamp, GEM is San Diego’s #1 GO-TO for EVENT PLANNING, HOSPITALITY CONSULTING, MARKETING & PROMOTIONS, and TALENTS. Together these four divisions operate in a synergistic equilibrium to deliver powerful results to the interrelated worlds of modern lifestyle, hospitality, nightlife, and special events for their clients. ► Gaslamp Event Management Inc.
We look forward to celebrating St. Paddy's Day with you in the world famous Gaslamp Quarter! Based in San Diego,Club VIP is Southern California's award winning event management,hospitality consultant,marketing and promotions powerhouse.